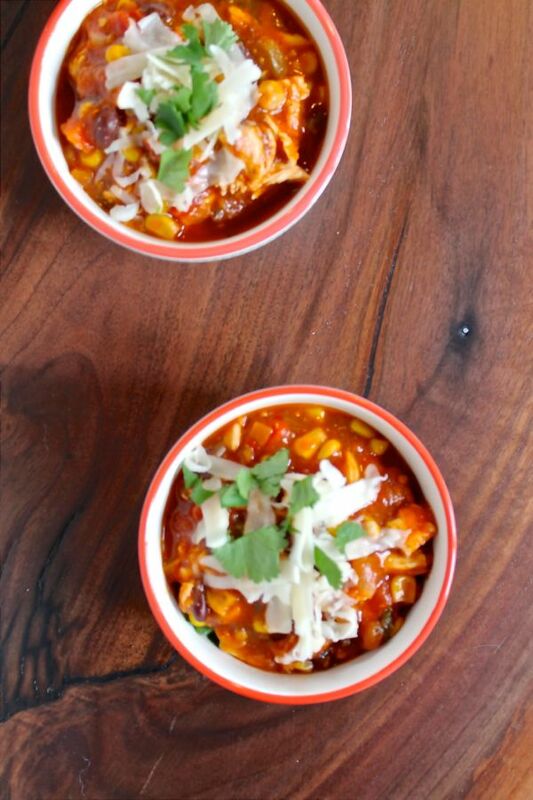 I invented the recipe for this Spicy Mexican Chicken Soup while I was working from home on a snowy day. The soup is the cross between a soup and a chili, it is hearty and thick, and if you let it simmer a bit longer it could even be a dip. The soup has chunks of shredded chicken, tomatoes, corns, beans, and a bit of spicy heat. I topped the soup with chopped cilantro and shredded cheddar cheese. 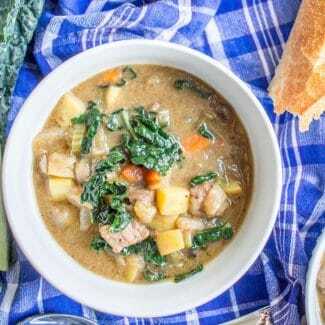 The added bonus to this recipe is that it can be prepared in under 30 minutes! 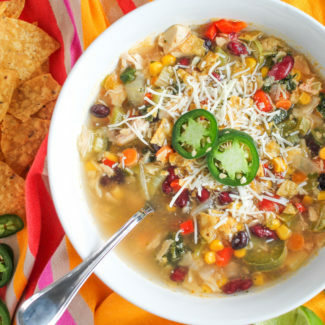 This Spicy Mexican Chicken Soup is loaded with vegetables and very filling. Instead of serving it with bread, you can dunk tortilla chips into it. The crunch and saltiness are a nice pairing for the soup. 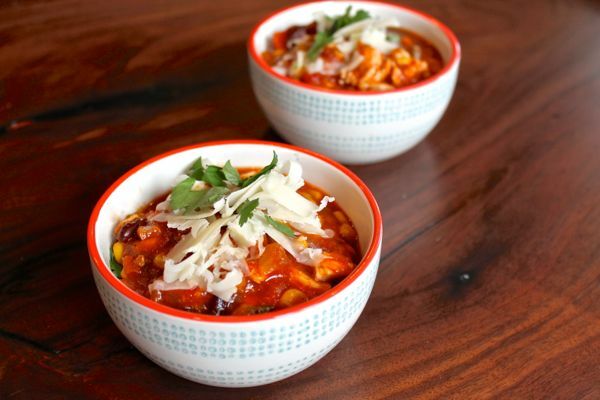 Usually making soup involves lots of chopping, but this recipe eliminates that. I used salsa and cowboy caviar to prepare this soup which provided a major shortcut. 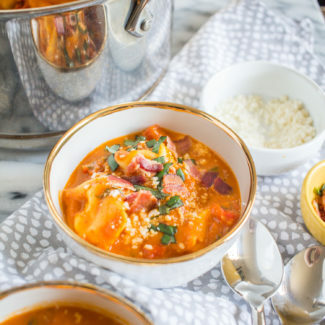 This soup can be made in under 30 minutes, and can be adjusted to have a mild or hot spice level. You could also add in extra ingredients based on your preferences. Bell peppers would add a hint of crunch, poblano peppers would add a little smokiness, jalapeños would up the spice level. 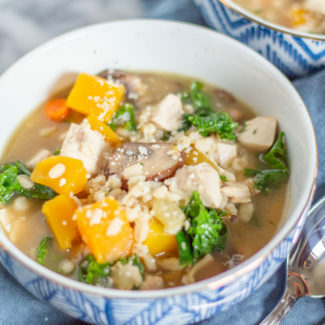 This soup reheats well, and would be a nice lunch to bring to work in the winter. You could also option to make a big batch and freeze half for later. 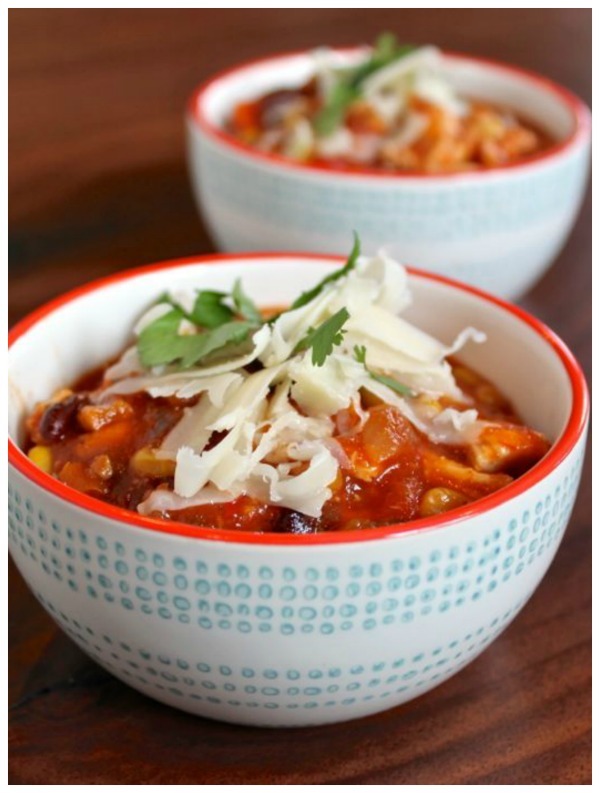 This soup is the cross between a soup and a chili, it is hearty and thick, and if you let it simmer a bit longer it could even be a dip. It has chunks of shredded chicken, tomatoes, corns, beans, and a bit of spicy heat. I topped the soup with chopped cilantro and shredded cheddar cheese. Pour the chicken broth into a sauce pan. Bring it to a boil. Chop the chicken breast into 3 or 4 evenly sized pieces. Once the broth comes to a boil, add the chicken. Let the chicken cook in the boiling broth for 5-6 minutes, until no longer pink in the center. Then remove it from the broth and let cool. Keep half of the broth in the pot (you can save the other half for something else). Add the salsa, bring to a simmer, and let reduce for 6-8 minutes, until thickened. While the salsa and broth are simmering, use two forks to shred the chicken. Add the cowboy caviar and shredded chicken to the pot. Stir, and let simmer for 3 minutes. 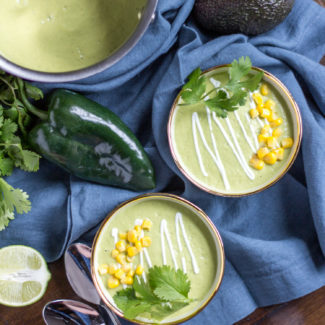 Serve the soup with freshly chopped cilantro and shredded cheddar cheese. 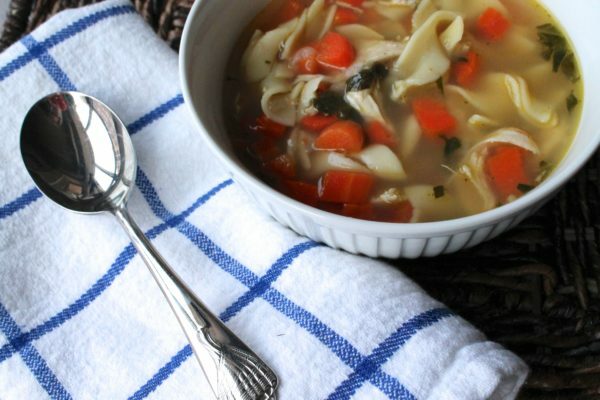 This Easy Chicken Noodle Soup might just help cure a cold, and it will definitely warm you up o a cold winter day. Want something a bit heartier? 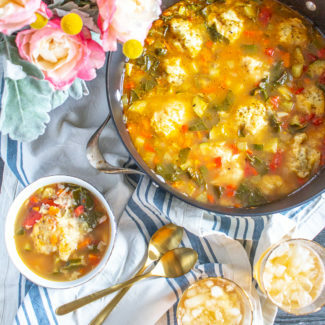 Try my Chicken and Vegetable Soup. 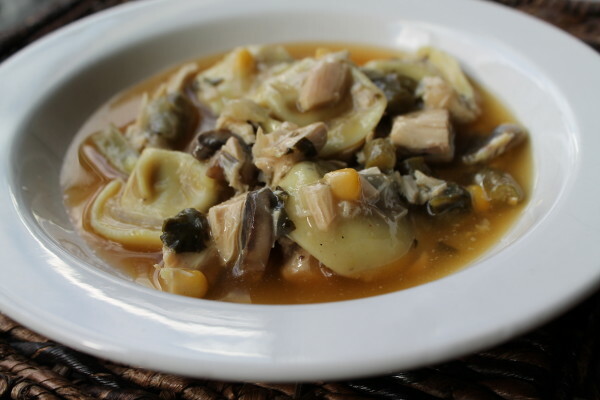 It’s loaded with chunks of chicken, vegetables, and cheese tortellini. 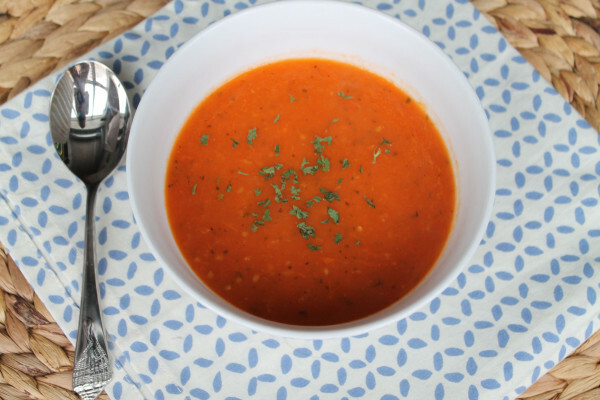 Herb Roasted Tomato Soup is vegan and paleo. It’s made with fresh roasted tomatoes and it tastes like summer even on the most brutally cold night.